Cabo del Sol - Ocean Course Hole 2: This par five has desert left and right off the tee. The second shot then needs to avoid a series of strategic bunkers. The green is uphill and to the right, featuring more sand traps and some severe undulations that make not hitting to the correct area a problem. Cabo del Sol - Ocean Course Hole 3: This short par four has a wide fairway for the player that wants to leave a shot of around 150 to a long, slender and angled green between two bunkers. A longer drive must avoid strategically scattered bunkers, but will leave a shorter and possibly a better angled shot to the undulating green. Cabo del Sol - Ocean Course Hole 4: Downhill all the way, the views of the Sea of Cortez are plentiful, but the desert is waiting left and four bunkers are waiting right on the first two shots. The green is then cut over a wide desert wash and is guarded by four more bunkers and has depth of only 25 yards. Notice the lack of fear and good angle taken by the 7 year old future contributor to this website. Cabo del Sol - Ocean Course Hole 5: One of the more intriguing par fours in the world, this drive is very tough with desert all around. Only the big bomb can clear the tree-lined corner of the trouble to leave a reasonable shot home. However, the hole is mercifully wide open around the green as if Jack knew that the drive was trouble enough for most. The views of the Sea and close proximity to it are great. Cabo del Sol - Ocean Course Hole 6: This is the first of the back to back seaside par threes on the front. This one is much longer and creates an amazing blend of desert landscape and ocean. The bunkers left of the green are actually merciful as they can rescue a shot that, while only a few feet left of the green, would otherwise find rocks, beach or the Sea of Cortez. There is plenty of bailout short-right, but less pin high to the right. There is also a small tier separating the back of the green from the rest of it. Cabo del Sol - Ocean Course Hole 7: A truly unique par three, this one has tee boxes on the rocky edge of the Sea of Cortez and the player shoots a wedge or short iron over a wide sandy beach to a multi-level green. the surface is surrounded by rocks and long-grass covered hills that give the hole a mesmerizing links feel to it, which is contrasted by the cactus-filled desert / ocean landscape of the tee box, filling the senses with three types of golf all on one shot. The three bunkers also make distance control paramount on this one-of-a-kind hole. Cabo del Sol - Ocean Course Hole 8: After the par threes, the golfer faces an uphill par four with a pot bunker in the middle of the landing area and desert was surrounding the island of fairway. The approach then has to cross a wide desert wash with a green complex that is eerily reminiscent of the road hole at St. Andrews in its angles, undulations and deep bunker. Cabo del Sol - Ocean Course Hole 10: This tough par four begins the back nine and is tight with desert on either side of the fairway, and playing usually into the prevailing wind. The approach shot is the key though as it must clear the desert and two very deep bunkers to find the angled and undulating putting surface. Cabo del Sol - Ocean Course Hole 11: The classic split fairway short par four is presented here by Jack with the distances and strategic choices with related rewards and penalties beautifully crafted. Cabo del Sol - Ocean Course Hole 13: This hole is mean! It is long with absolutely no where to hide other than the green or maybe the deep fronting bunkers. Any shot hit less than perfect will generally lead to double bogey via desert or the small creek short of the green. The author played this hole three times and never got close to the putting surface from the tee, salvaging one lone bogey for the effort. Cabo del Sol - Ocean Course Hole 14: No rest for the weary on this target golf par four. The tee shot needs to find the rather small fairway and the failure to do so will spell doom in any direction. If negotiated, the second shot mus clear the creek-filled arroyo to a deep and angled green. Right is bad but short-left is an okay miss. Cabo del Sol - Ocean Course Hole 15: This downhill par five serves up the last good shot at birdie as it is pretty wide. A big drive that avoids the bunker will leave the rest of the hole pretty accessible, at least when the pin placement is right of center. When it is cut left, the green can only be attacked with a high shot. Cabo del Sol - Ocean Course Hole 16: This tough driving hole has a long forced carry and a fairly tight landing area with desert and bunkers left and right. The approach is then idyllic down to a green perched on the edge of a Palm tree and cactus-lined cliff above the beach. The green is very narrow and has bunkers on either side making this a challenging and beautiful hole of the highest order. Cabo del Sol - Ocean Course Hole 17: On a course filled with potential signature holes, I think this one is the most famous. 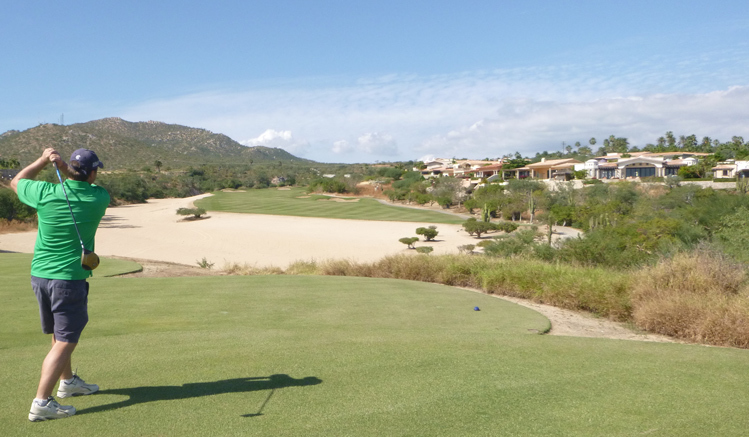 From the back tees, the angle to the green, over the Sea of Cortez, beach, rocks, and bunkers, is a formidable one. Slightly easier from the other tee boxes with a more forgiving angle, this hole is truly a gem. Cabo del Sol - Ocean Course Hole 18: The last hole of the day clings magnificently to the cliffs above the beach but requests the golfer to get close to the trouble right off the tee to give a better angle to most pins on the green, which is also right on the edge of the beach, with collection bunkers both left and long.